The Wales Abdominal Aortic Aneurysm (AAA) Screening Programme is completing 5 years since its inception in May 2013. The latest figures indicate that between May 2013 and March 2018 >75,500 men were screened and 905 AAAs were detected using the screening programme. 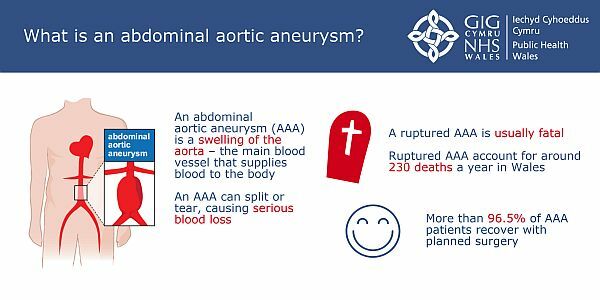 The Wales Abdominal Aortic Aneurysm Screening Programme is celebrating its fifth birthday this month with a series of events across the country. Between May 2013 and March 2018, the programme screened more than 75,500 men and detected 905 abdominal aortic aneurysms (AAA). Of these, 140 men have been referred to vascular services for treatment. To celebrate its success, the Wales AAA Screening Programme is holding birthday parties across Wales featuring stories from men whose lives have been saved. An AAA is a swelling of the aorta – the main blood vessel that supplies blood to the body. An AAA can split or tear, causing serious blood loss. When they do rupture, they are usually fatal and account for around 230 deaths a year in Wales. However, more than 96.5 per cent of AAA patients recover with planned surgery if they are screened in time. The test is a simple, non-invasive ultrasound of the abdominal aorta. All men in Wales are invited for screening when they are 65 and uptake is 80 per cent. “The Wales Abdominal Aortic Aneurysm Screening Programme was the first male-only national screening programme. Since our launch on 1 May 2013, four out of five men have attended for their AAA screening ultrasound scan. “Before the programme, there were only three local AAA screening programmes across Wales. By merging them into one national programme, we have ensured that all 65-year-old men living in Wales and registered with a GP are offered screening. Screening is currently offered to men in South Wales prisons and will be extended to men in Berwyn Prison, North Wales, by the end of the year. There are also plans to offer screening to men in long-term care. The Wales AAA Screening Programme is one of eight screening programmes run by Public Health Wales.